Prof. Bi's Lecture -- The cognitive neural mechanisms of object (conceptual) knowledge. Title: The cognitive neural mechanisms of object (conceptual) knowledge. Semantic memory (conceptual system) serves as a foundation for various cognitive processes including language, object recognition and use, reasoning, and problem solving. How is semantic knowledge represented in the brain? I will present a series of experiments in my lab that explored this issue, focusing on object shape and motion knowledge, as well as its functional and structural connectivity basis. We used a convergent of approaches including brain imaging studies with healthy, blind, and brain-damaged individuals. The overall results indicate a large scale of network including left temporal, parietal, and frontal regions that underlies semantic processing. 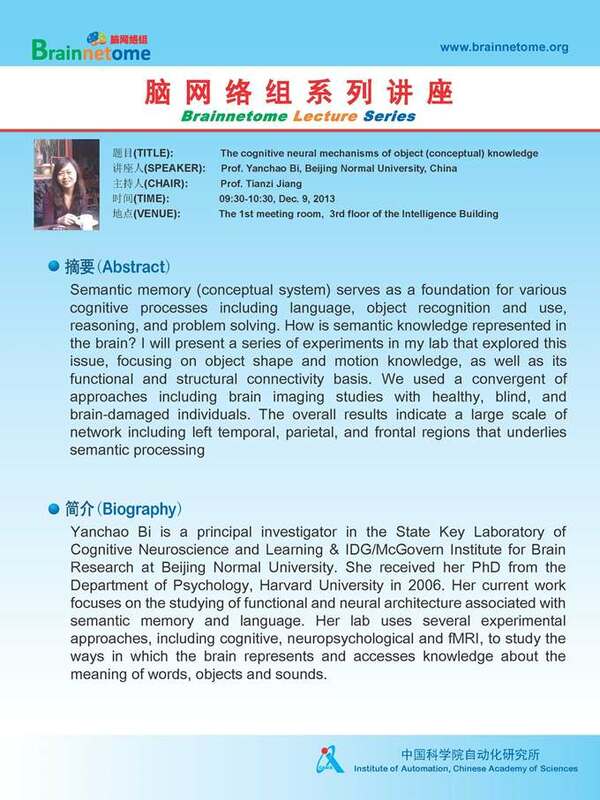 Yanchao Bi is a principal investigator in the State Key Laboratory of Cognitive Neuroscience and Learning & IDG/McGovern Institute for Brain Research at Beijing Normal University. She received her PhD from the Department of Psychology, Harvard University in 2006. Her current work focuses on the studying of functional and neural architecture associated with semantic memory and language. Her lab uses several experimental approaches, including cognitive, neuropsychological and fMRI, to study the ways in which the brain represents and accesses knowledge about the meaning of words, objects and sounds.